Amon G. Carter is likely a familiar name to many people who are from North Texas. He was born in a log cabin to William Henry and Josephine Ream Carter in Crafton, Texas in 1879. Amon’s mother died when he was still an infant. His father was a blacksmith and a farmer. Due to the family’s financial situation, Amon left school and began working by doing odd jobs, whatever work he could find in Bowie, Texas. In his teenage years, he continued to move around a bit until he finally settled in North Texas. One of his early sales jobs was to sell chromolithographs, which were was mass produced printed items of artwork made for display in residences. Its subjects usually included copies of famous oil paintings, religious scenes, as well as landscapes, still life scenes and animals. Chromolithographs gradually fell out of favor but millions of the decorative items were sold. By about 1905, Carter had moved to Fort Worth where he began selling advertising space. Shortly thereafter, he became part owner and began to publish the new Fort Worth Star which ran its first issue February 1, 1906. The publication barely stayed in business until Carter successfully was able to acquire the city’s rival newspaper, the Fort Worth Telegram in 1908, combining the two papers the following year. From that point on, the publication grew to dominate the area.The Fort Worth Star Telegram enterprise would expand to create radio station WBAP in 1922 to be followed by the state’s first television station, also WBAP, in 1948. Carter was self educated, but had a life long interest in higher education. In 1923, he was nominated to the first board of directors of Texas Technological College, a school he helped found. He served as chair of the board until he resigned in 1927. Carter helped fuel the rivalry between Dallas and Fort Worth. It was said that if he had a meeting in Dallas, he would carry a sack lunch so he would not have to spend any of his money in Dallas. Carter is credited for the development of the following: Fort Worth Academy of Medicine, a dormitory for St. Joseph’s Hospital School of Nursing, YMCA Camp Carter, the Aquarium of Fort Worth, Lake Como Park, Carter Park, a location for Fort Worth Osteopathic Hospital, a location for St. Theresa’s Orphans Home, Will Rogers Memorial Coliseum and Auditorium, Methodist Hospital. He is credited with the following companies having located in Fort Worth: Southern Air Transport (a predecessor to American Airlines), Convair (became General Dynamics), General Motors, Bell Aircraft and others. He became wealthy from petroleum revenues after years of drilling many dry holes. His oil and gas interests funded the Amon G. Carter Foundation which has a long history of philanthropy in Texas. He was a major contributor to Texas Christian University’s on campus football stadium that still bears his name. He had a life long interest in aviation which led to the establishment of Amon Carter Field (later known as Greater Southwest International Airport) that was in operation until it was eclipsed and made unnecessary by DFW Airport. How many people have a mountain named after them? Amon Carter Peak in the Big Bend National Park was named for him in consideration for his efforts in establishing the park. Also bearing his name is Amon G. Carter Lake near Bowie. 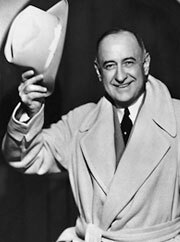 Carter’s health declined as he got older and he died of a heart attack in 1955, but his generosity and tireless promotion of Fort Worth will be long remembered. I had cousins who lived outside there, so I enjoyed going to Ft. Worth long before I knew Dallas at all. Amon Carter was an interesting person, all right. He was the essence of what Texas should become…..you have a class entrance to Dallas by 1936, it is then home to the worst event in Texas History from November 1963……and the man who shaped the modern city away from the old Country town made that impact….then again change is not good for Texas, never has been…ruined the dust it has been famous for…..hahaha.